Who knew the God of Thunder could actually smile, laugh and seemingly have a good time? Thor: Ragnarok proves it’s actually possible, creating a lighthearted adventure that will give Guardians of the Galaxy a run for its money as the most fun movie released by Marvel Studios! For the longest time, of all the big-screen Avengers’ adventures, Thor’s standalone films have been the most underappreciated. While they have been great, they might not have been everyone’s cup of tea. Telling the tale of a superhero who lives in another realm and seems like an alien may have been a tad difficult and relatable for mere humans. And after The Dark Knight aired in 2008, so many superhero films chose to tell super serious, very dark tales. That style may have been a very big mistake for the first two movies of this franchise. No longer fighting Frost Giants or Dark Elves, Ragnarok translates to “the end of the universe” in Norse mythology and might just foreshadow the end of Asgard, as told in bright, neon lights, full of vibrant colors. 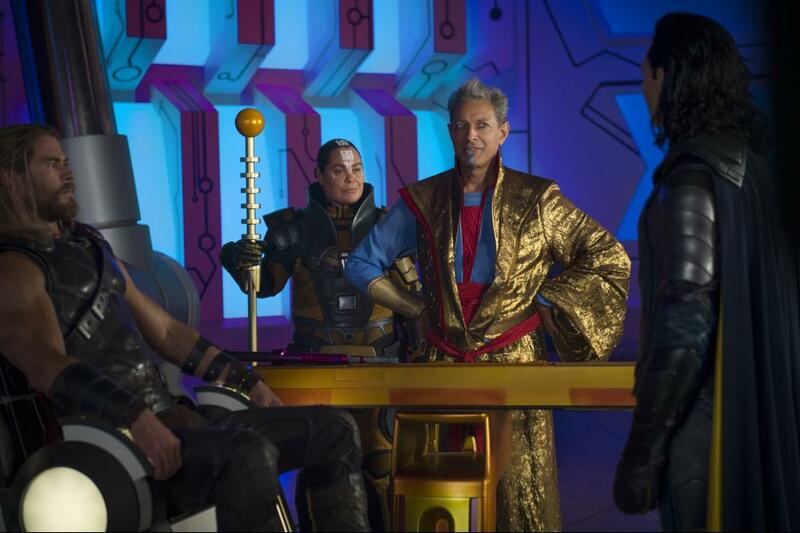 With a synthesizer-fueled soundtrack, cued and composed by Mark Mothersbaugh (of Devo fame) and plenty of laughs, Thor: Ragnarok just feels… so ’80s. No longer super dark, this is more of a Marvel team-up story that could have been found in the comic books. In fact, the movie begins with Doctor Strange’s introduction to Thor and Loki. Thankfully, he’s not the only crossover character. Sprinkled into the story is Hulk (who sadly has more screen time than Mark Ruffalo’s misused Bruce Banner) and the introduction of Grandmaster (Jeff Goldblum), Hela, Goddess of Death (Cate Blanchett) and the fallen Asgardian, Valkyrie (Tessa Thompson). There’s heroes seeking redemption and some unresolved family issues that are revealed as Thor fights for his life on the Battleworld, Sakaar and an epic, realm-shattering battle wraps up the film, with hints of a franchise crossover that should lead to the upcoming Infinity War. Bruce Banner is dealing with an identity crisis. Tessa Thompson is great as a once-proud soldier. Cate Blanchett DEFINITELY needs to do more “Bad Guy” roles. Karl Urban’s Skurge is a misunderstood character who wants recognition and fame… from all the wrong places. And Jeff Goldblum is back, baby… doing his best Jeff Goldblum role, ever: a character who is a little nerdy, nervous, skiddish and studders just a bit. So, where has Director Taika Waititi been all this time? Why has Marvel Studios waited this long to push the boundaries of the superhero genre? And how long until we can get another one? With this one movie, Taika has already proven his ability as a director to stand side-by-side with the groundbreaking Joss Whedon, James Gunn and the Russo Brothers. It’s not a moment too soon. Hopefully this won’t be his last entry within the Marvel Cinematic Universe. If you didn’t care for the previous Thor films, definitely give this one a shot. You might just be surprised about how much fun you never knew you could have while watching a superhero story unfold.